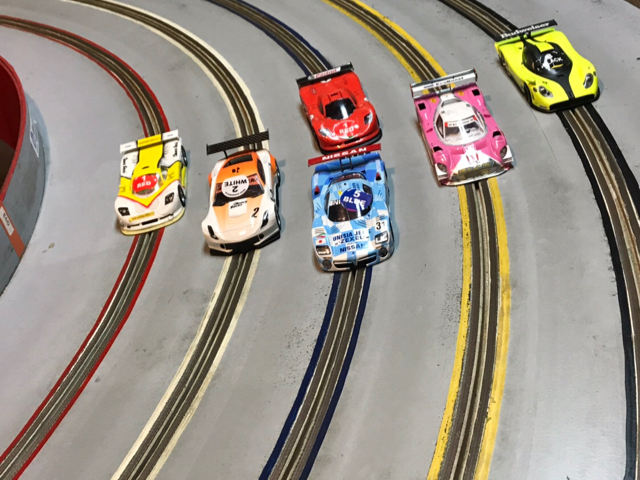 Ask any Slotblog member if they are aware that there's a slot car enduro that's holding its ninth annual 24-hour event in a couple of days and it is guaranteed almost no one will know what and where it is. There will be a few who will know, as a several Slotblog members have been participants in the past and will be competing again this year. The Slotblog report on last year's race can be found HERE. In many ways, the world of 1/32 slot racing is as self-absorbed and fragile as are the 1/24 and HO slot racing universes, so mucho kudos to Clover Leaf Racing (a 1/32 slots mail order shop based in Michigan) for keeping this popular event going for almost a decade and for assisting me with this year's coverage. I really, really want to attend this race, but the eleven-hour drive is a significant deterrent. The 130' five-lane track used for this event is not located in the Clover Leaf store, but is in co-owner Mike Stott's basement. It looks to be a unique and challenging layout that is run clockwise. I'm told that there are six teams, so there will be one sit-out racer each heat. This year there's one racer coming from British Columbia and if he doesn't get the long-distance award, I want to know who does! I'll list the teams and their members when I can. The race starts Saturday morning. The racers spend an actual 24 hours racing on the track, via (I think) 30 heats of 48 minute length. 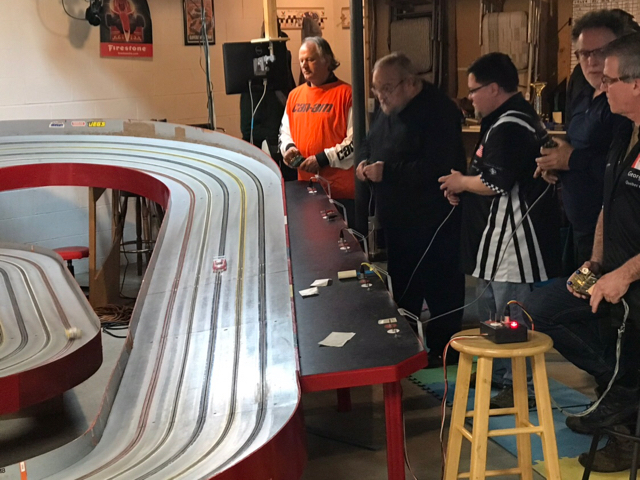 A race like this is difficult to cover from afar, so after brainstorming with Mike Stott and Steve Sawtelle, a co-owner of the Slot Car Corner 1/32 slot shop who is also involved in putting on this race, we're going to try something a bit different. It's not really feasible for a single racer to post coverage like has been done with other big races here at Slotblog. Racers are simply too busy racing, marshaling, and, believe it or not, snoozing. To recap, this is the initial info post about the race. Then there will be a live stream link in a post I'll make in a few, but keep in mind that the stream won't go live until Saturday morning. And of course, the final results will be posted after the race concludes. Heck, we may even have some pictures; the ones taken by Christian Gingras that were posted last year to Slotblog's Facebook page were terrific. I think this is my sixth or seventh year competing in this race. The whole set-up couldn't be better for a 24-hour race, from the host, to the track, to the food, to the pit space, to the accessibility of the motel we keep a room at. With six teams competing on a five-lane track it takes a little over 30 to do the race. We'll start at 10 AM on Saturday and finish at about 4:15 PM Sunday. In some ways having six teams makes it a little easier to do a sleep schedule but it's a long 30+ hours. 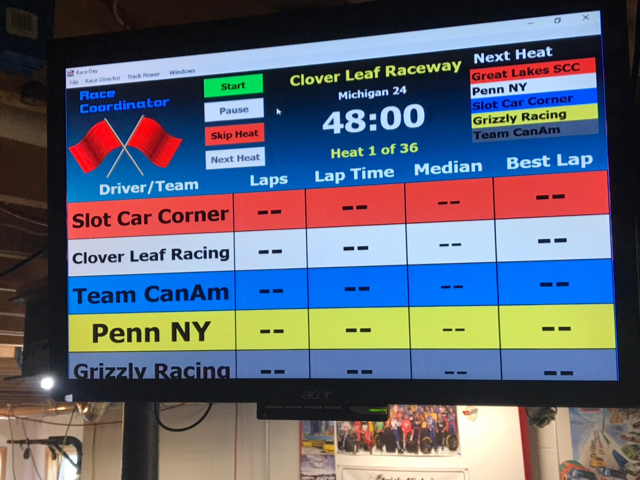 Our team "Grizzly Racing" consists of six drivers: myself, Eric Balicki, Steve Howey, Greg Kessler, Rob Hall, and Mike Garrett ('Raisin' on Slotblog). Last year we finished third. When you are dead, you don't know you are dead. It is difficult only for the others. Well, after the power went out this morning it is now back on. The loss of power has really put me behind schedule but I guess i will be working a little later tonight. Getting ready to head out the door. Greg and I should be there around 9 AM. It's about time to head out the door. So you all there soon. Well, the teams have started arriving for test and tune. Actually had the Canadians arrive last night, we have one from British Columbia, one from Montreal and two from Quebec. Make sure you check out the live feed tomorrow at 9:30 AM. There is a separate post with the live stream feed embedded. Click HERE. The race coverage with pics and commentary is at this LINK. I may have missed it but what kind of cars are they running other than 1/32 scale? Here's a PDF of the 2019 rules for this event. Most of the racers left to have dinner and plan for tomorrows 10 AM start. Besides myself, theres one other Retro racer participating in this years race. None other than the Amazin Raisin. We have a clear favorite car for the race but we will see how the cars work tomorrow. Do not count out my Chicago area group Great Lakes Slot Car Club. They prepared better this year. Not going to count them out. They were setting the fast times in practice. Huge improvement from last year. Seven minutes into the race. Slot Car Corner on Red, Great Lakes on White, Team Can Am on Blue, Penn NY on Yellow and Grizzly on Black. KAOS is sitting out. New link for live streaming of the race. We have now started the night driving. One of my favorite aspects of the race.